With the new-year, more new members joined the team of Agiboo, strengthening our efforts investments in the scope and quality of Agiblocks. Agiblocks it’s not just a CTRM system, is a specific CTRM system designed according to the needs of small and big enterprises, which are trading agricultural oρ soft commodities. We enhance and grow our functionality base through frequent releases, with respect to our release management we are investing in our quality processes aiming to work towards continuous delivery. Sashidhar joined recently our Software Testing department and we couldn’t miss the chance to annoy him with a short interview during the lunch break. 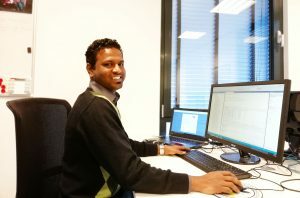 Are you ready to meet our new Software Test Engineer, Sashidhar? -Hi Sashidhar, welcome on board! Can you tell us a bit about you and your background? Hi, thank you, I am also excited joining you! Well, I’m Sashidhar Joganna a test professional. I have 13+ years of experience in the software development process. I have worked in banking and energy sector carrying out test activities for software development using the traditional waterfall approach and agile methodologies. In addition, I’m also a tech savvy person with knowledge of C#, mainframes and few scripting languages. -What is your experience in testing software systems? I have vast experience in testing complex systems in banking and geoscience industry. In the banking domain, have worked for wholesale and retail markets testing different applications related to trading and mortgages. Also, managing test activities from requirement analysis to execution of tests along with business stakeholders in order to satisfy their needs has been my key skills. -What is are your key goals and expectations working in Agiboo? Test automation is indeed a challenge to keep the quality of the product high. Especially within this fast-changing market and have experience in setting up an automation test framework. For example, some tools to credit to my knowledge are Coded UI, Test Complete and Specflow. Moreover, implementing test automation for continuous delivery is one of the key goals. Thus, I have been working through which and remains in line to my role at Agiboo, where I will utilize my skills to provide a quality product to our customers. -Well, enjoy your lunch Sashi and success for your new role!